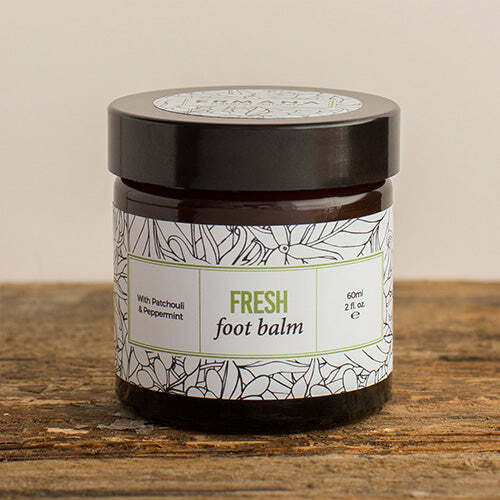 Our fresh foot balm is a rich blend of natural butters which protect and soften the skin. 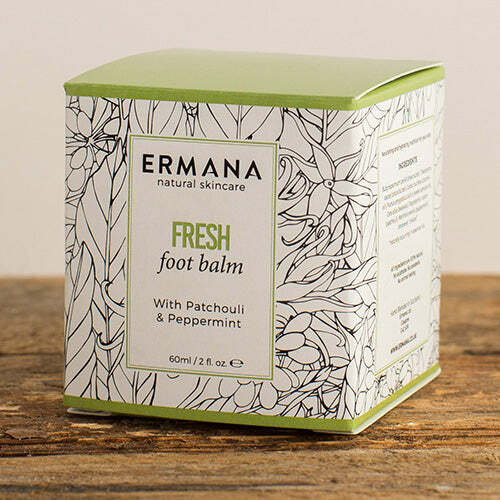 Hand blended with sweet almond oil and beeswax and infused with peppermint and patchouli pure essential oils to cool and freshen the feet. Patchouli is a strong, musty smelling oil and comes from the bushy patchouli plant which is native to Malaysia. It is useful in treating a wide array of skin conditions, as well as internal inflammation from conditions like arthritis and gout. As well its anti-inflammatory properties, it is also fungicidal and a cell regenerator making it ideal for treating fungal infections like athlete’s foot and cracked skin problems. Patchouli is also known to act as a deodorant as the strong sweet, spicy and musky aroma of this essential oil can eliminate and mask body odour. Peppermint is a European plant which produces a menthol oil with a mild antiseptic affect. It helps control bacteria on the surface of the skin. It is refreshing and cooling. DIRECTIONS – warm a small amount between the fingertips until the balm melts, massage into the feet, concentrating on areas of hard skin. Suitable for all skin types. Do not use on broken skin.